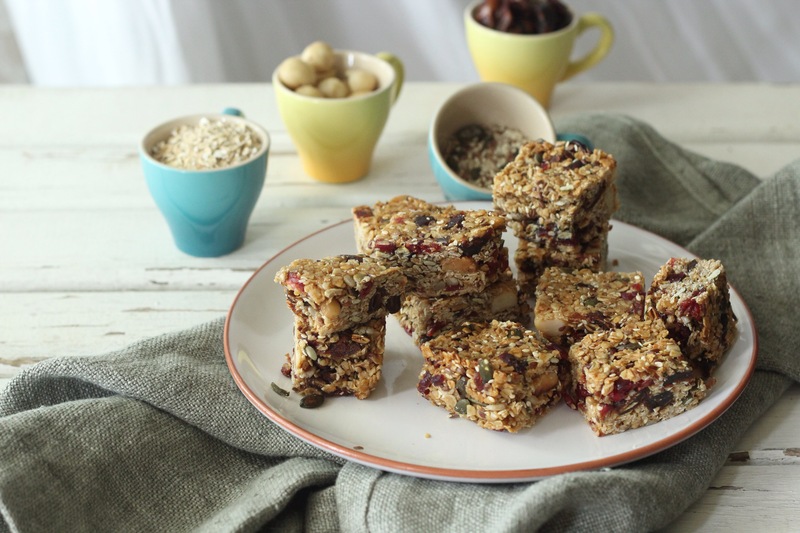 Cranberry, Date and Macadamia granola bars. Every week I mix up a batch of granola bars, every week a different recipe, each week a different taste and texture. I’ve never been happy with any recipe I’ve tried until I tried this one. Whilst looking for inspiration for my next post and researching recipes, I had the TV on the food network channel on a really soft yet audible tone. When I noticed Anna Olsen about to make her Granola bar recipe, I stopped searching and adjusted the volume with all eyes on the screen. 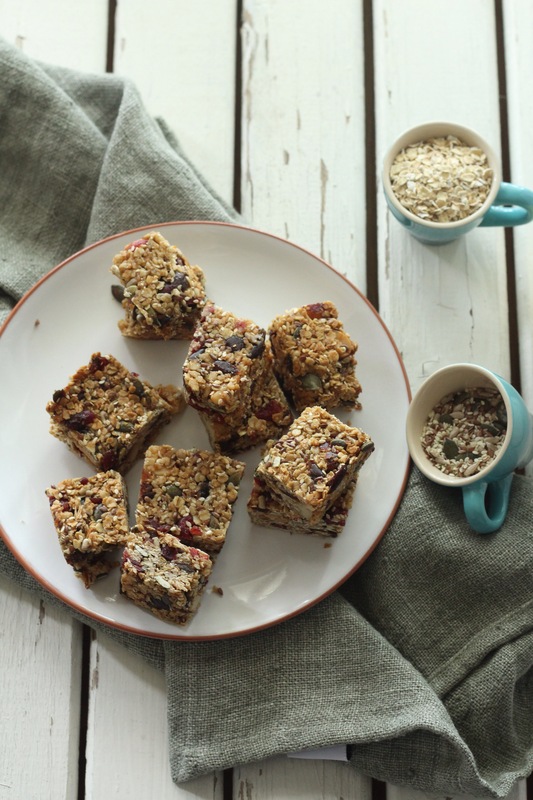 Her recipe seems very easy and tasty and had me wondering what have I been doing all this time with all these disappointing granola bar recipes! Sunday, I schleped my partner along to a prop and background sourcing haul at the Milnerton Flea market. Feeling quite chuffed with all my treasures I couldn’t wait to play around and shoot something with them. I made the granola bars on less than a few hours sleep and much zeal after my haul. I couldn’t believe how easy and fuss free the recipe was, I toasted the oats and nuts along with a seed mix which consists of pumpkin, linseeds, sunflower and sesame seeds and added to all the ingredients along with the melted coconut oil and warmed honey pressed down firmly in a parchment fitted pan and baked for 15 minutes. Allow to cool completely in the pan before slicing. I cooled in the fridge to set further, to have a more firm and chewey texture you don’t have to do this(I just wanted to be sure that this time when I cut into the bars they won’t fall apart instantly). It was indeed love at first bite, I love the crunch and saltiness of the salted and roasted macadamia nuts and the tartness of the cranberries married with the sweetness of the dates.A match made in heaven. I love how I can control what goes into the bars, as opposed to the mysterious artificial ingredient packed store bought ones. 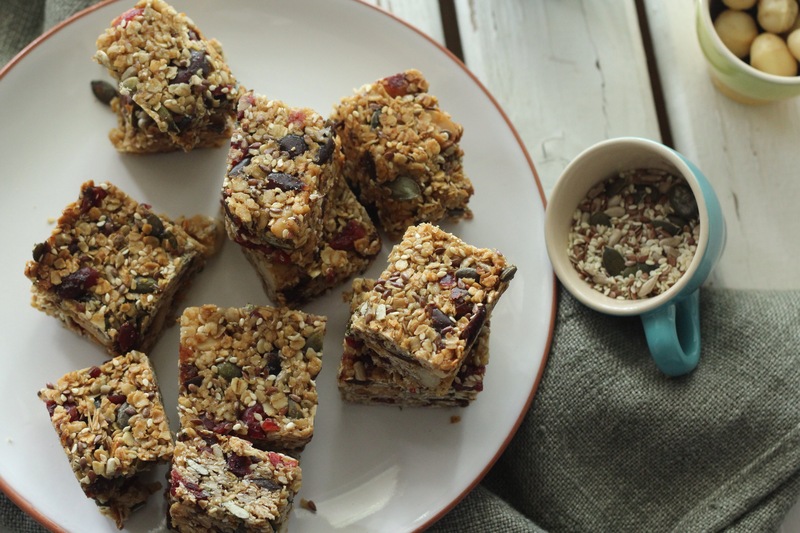 I make these scrummy bars for my partner to take along to work as a midday ‘pick me up’ snack and the bars are great for kids to take along to school for a healthy energy boost. 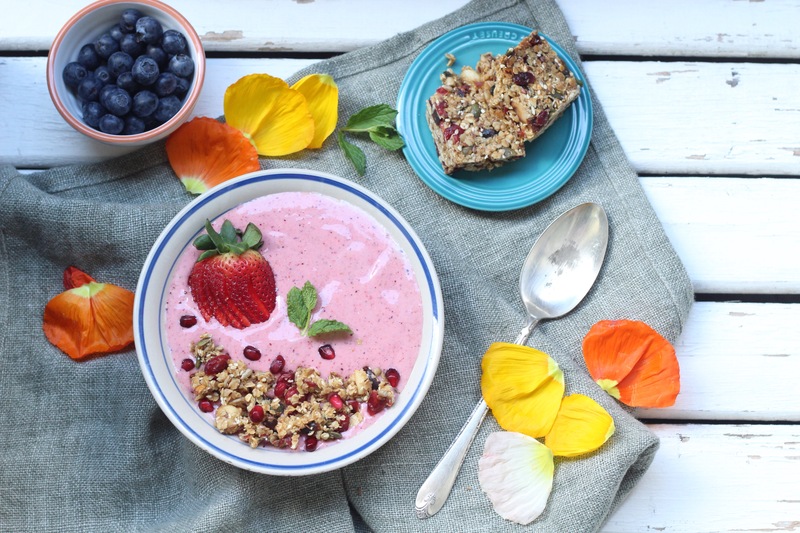 I decided to make a smoothie bowl as a great idea to use the granola bars as part of a full breakfast meal, the quick and easy on the go option might not be for all. I used my trusty NutriBullet to blitz up berries, frozen banana slices, coconut milk and water to thin it down. serve in a bowl or cup with the crushed granola bar pieces. 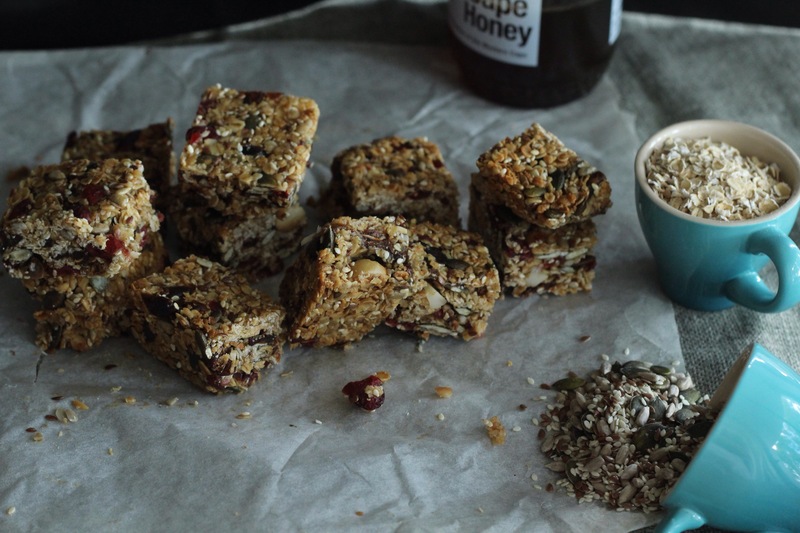 As I type this blog post, my iPad is covered in sticky finger marks from all the constant munching on these glorious granola bars.